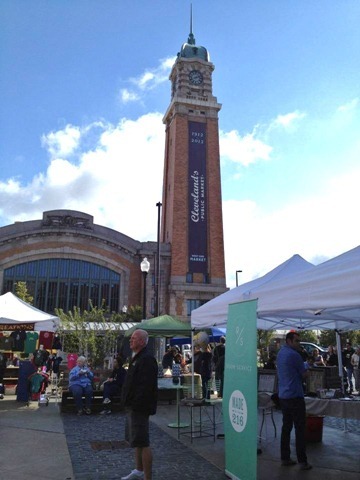 With the 100th anniversary of the West Side Market fully underway as the Project for Public Spaces’ (PPS) conference kicked off this weekend, suddenly Cleveland has been trust into the spotlight. Thanks to chefs like Michael Simon and a multitude of programs on the Food Network, Cleveland’s been earning attention for our culinary prowess since the late 2000’s; however, only recently has the discussion of fresh, local food and public access been discussed in the context of rebuilding and revitalizing streetscapes. 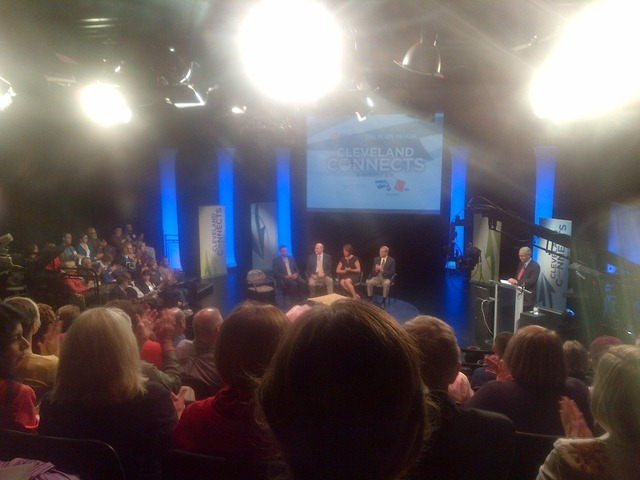 Earlier this week I attended an event at IdeaStream in Downtown Cleveland called “Cleveland Connects”. This discussion, opened by David K. O’Neil (Senior Director of Markets for PPS) featuring panelists including Great Lakes Brewing Co. founder Patrick Conway and entrepreneur turned farmer Randell McShepard, focused on the lost marketplace. I was astounded to learn that Cleveland once played host to a market in nearly every neighborhood. These now destroyed markets were the lifeblood of the town’s activities before American society’s post-WWII’s move towards mass production (think Folgers and Wonderbread). Also, according to Conway in the 1880’s there were 3000 breweries in the United States and only 300 by 1980. The re-emergence of craft brews, chocolates, coffee et al is also a fine source of re-establishing faltering districts. 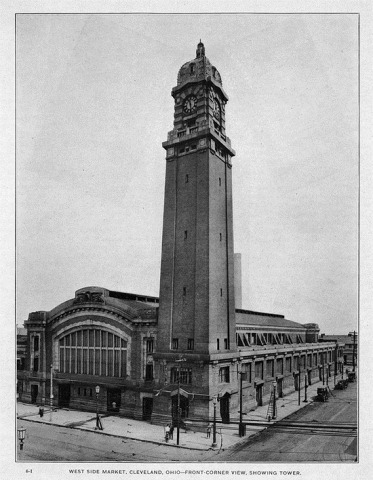 As I learn more and more about Cleveland’s storied past from the people trying to reinvigorate it, pure luck or misfortune determined whether or not great institutions were honored or destroyed. Unfortunately, Cleveland’s leadership made poor decisions as early as the 1950’s in an effort to “re-urbanize” – building highways that cut off views and access to Lake Erie and destroying building stock in favor of public housing. While the discussion on Thursday began with the statement “food matters”, the dialogue evolved into the position that “place matters”. ‘Placemaking’ has interested me from the day I learned the term in an urban studies course. It relies on combining public access and assets with amenities that people need or otherwise cannot find anywhere else. Placemaking is about crafting an experience, through streetscape and architecture. And so while there is debate as to whether non-local fruits should be sold inside the West Side Market and while the public spaces conference this weekend was decidedly exclusive of the general public, with paid entry fees and gala tickets costing upwards of $300, it is obvious that the re-investment in the surrounding corridors has led to greater success at the Market and in turn, the Market lends it’s visitors to neighboring restaurants, bars, shops and parklets. 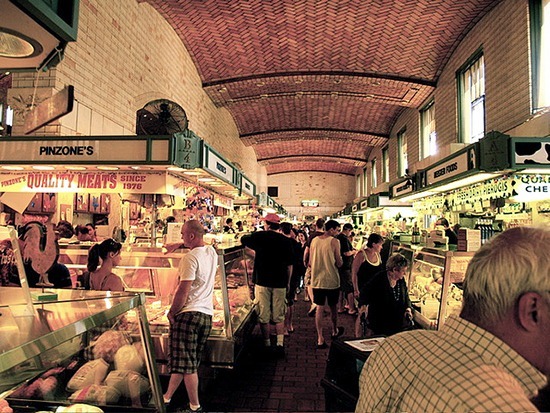 The West Side Market does year round for Ohio City what Saturday Farmer’s Markets do for their surroundings for a fleeting period of time. Particularly, the newly renovated park directly across the street from the Market, aptly called Market Square Park. The only unbuilt upon chunk of land along the booming W. 25th + Lorain corridor wasn’t always an asset, but recently made Freshwater’s Top Five list of public spaces in the city. Because of the collaborative feel of he neighborhood, surely local businesses will find themselves programming the park so that it becomes one with the streetscape. But what can these success stories – a 100 year old market, new, thriving restaurants that focus on local food sources and parks do for cities like Cleveland, which loses population yearly and has a sickeningly high poverty rate and enormous stock of segregated, public housing? How does an $8.50 orange juice, a bicyclists’ bar and farm raised tilapia at upscale dinning establishments influence single moms who find it easier and cheaper to feed their kids McDonalds over quinoa and zucchini? How does creating a marketplace that sells prints of 1920’s Cleveland for $100 impact a poor family’s decision to come and enjoy the space? How do make a public space seemingly available to everyone, without regard for age, race or economics? I believe good food can be transformative, for an individual’s health as well as the for the vibrancy of a district. I look forward to the dialogue and decisions that arise from the PPS conference and related events as we search for ways to improve our access to food, our knowledge of growing local and our ability to provide equal opportunity for all neighborhoods’ growth.